We have 34 " Excellent" Tripadvisor- Flipkey reviews . Oue weekly price star from 300 Euro per week. A DIFFERENT STAY IN TUSCANY !! 5 Apartments to be rented individually or jointly . and east of Siena( 25 miles ). The highway A1 and the train station are 8km far. 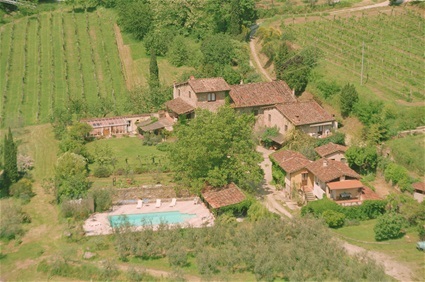 The property has 11 bedrooms and 11 bathrooms and is located in the center of Tuscany“. Molino Le Gualchiere “ is a residential estate. A collection of 3 small buildings in an old rural setllement of the 14th century, restructured in 5 charming apartments ( 900 square meters in total ) with a small farm ( 3,3 hectares ) with olive-trees and a small vineyard. 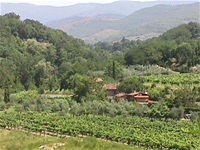 It is ideal for a group, a family or friends willing to share the beauty of Tuscany in a very private environment. 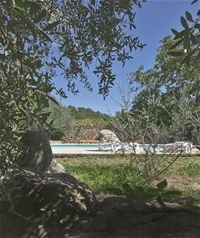 3 Old Buidings in a very quiet surrounding : perfect to relax and enjoy Tuscany. Rent the whole property , a small or big apartment for one or more weeks : experience our hospitality and the special athmosphere . We still have values and stick to them. We support a non-profit association and our prices are very low !! The location is superb, equidistant from Florence, Siena and Arezzo and the place itself is utterly beautiful, with vineyards, olives, a river at the end of the property; at the end of a small side road with no traffic , it is completely calm in its setting. The nearby charming small town of Loro Ciuffenna has excellent restaurants and coffee bars. THE MILL is considered of historical relevance by since its oldest parts date back to the 14th century. Originally its main activity was to mill olives, chestnuts and maize .The water was diverted from the Ciuffenna stream running along the property and stocked in a big stone-built millpond on the back of the main building and used when necessary to push horizontal paddle wheels under the main building .The turning force produced by the water on the paddles was transferred by a shaft to the runner stone, causing it to grind against a stationary stone of a similar size and shape. 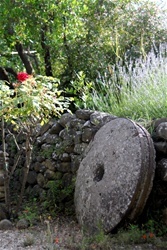 It is possible to see in the nearby medieval village of Loro Ciuffenna a similar, smaller Molino still working . Since mills used to stock oil and flours in big quantities, they were often attacked by robbers ; for this reason the oldest part of Molino is built like a fortress with deep stone walls and loopholes to allow the inhabitant to defend their belonging from attack of small gangs. Molino has been bought in 1991 by the present owners and carefully restored with terracotta floor and ceiling tiles , wood beams and antique furniture, in order for the inhabitants to experience the feeling of living in a traditional Tuscan stone built farmhouse, but with all modern conveniences. Swimming pool, Finnish Sauna and Mini-gym are also available. Is it possible to rent one or more apartments . Contact me at robertoboyer@libero.it. How much is this property? Could you please send info and prices for apartments for the 3 of us. We are arriving April 19th for 4 nights. We are interested in the price for 1 room, 3 adults (husband, wife, 20 yr old daughter), arriving April 19th for four nights. Tks : we rent apartments not rooms .